Getting started with Botox and filler injections through Botox Training MD, a comprehensive online video training course. Here's a welcome message from Marc Scheiner MD, the Botox Training MD online course instructor. We’re here to help you start learning how you can add Botox and fillers to your practice. There are a lot of tabs, options and videos inside of the coursebut there’s no need to to feel overwhelmed. 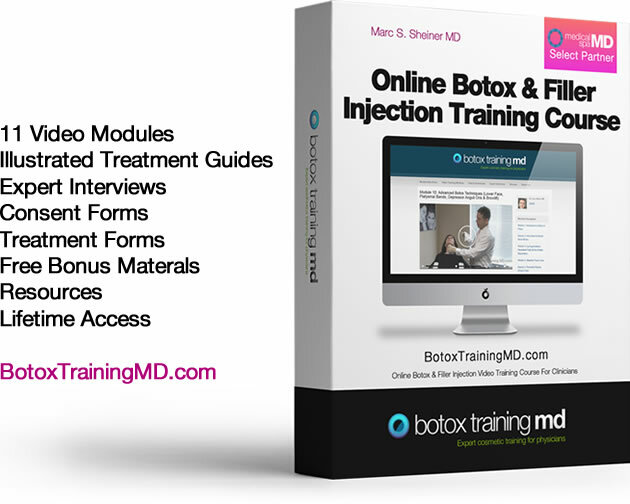 Botox Training MD Video Modules: This is where you'll probably want to start. You’ll want to watch these videos in order since they build on each other and we often refer to previous modules. These videos will walk you, step-by-step, through the individual treatments. Here are two very short excerpts from Botox Training MD's online video training modules from module 5 on using Botox for periorbital rhytids (crows feet) and another excerpt from module 11 on advanced filler techniques. Illustrated PDF Treatment Guides detailing exactly how each treatment is performed, how it can be modified for best results, and how to avoid complications. Resource Guides show you where to find the best deals on products and services to grow your practice without breaking the bank, from managing your legal structure to adding marketing resources. Consent & Follow-up Forms: Use the same forms that I use for my own patients! Informed consent, follow-up, treatment records and more. Best of all, they’re delivered as Word documents so you’ll be able to modify them with your own logo, address and any other information you may want. Discover the secrets that only the real insiders know. Learn from physician experts that have been performing Botox and dermal fillers for years. These experts take you inside and share their secrets with you. What works. What doesn’t. What to look for and what to avoid. You’ll have insider information that you can’t get anywhere else on marketing, consultations, staff training, up-selling, pricing and every other aspect of cosmetic medicine. Bonus Courses, Guides, Special Offers and Resources. Cosmetic services are unlike traditional medical services and demand an understanding of new techniques as well as getting a handle on marketing and advertising. Our free bonuses will teach you how to sell without being ‘salesy’ or turning clients off, how successful physicians are marketing these treatments, and you'll be able to access some special offers that will save you money on products and services that you'll actually use. NOTICE: This course is offered exclusively to physicians and clinicians who are licensed to perform these treatments in their geographic location. How would you like to add a high-profit and EASY way to add another income stream to your practice? Botox Training MD is a comprehensive medical training course that will get you up and running with high-profit cosmetic treatments within days, even if you’ve never performed a single cosmetic treatment and don’t know where to begin. Believe me, I know. I was once in your shoes, which is why I can relate to how you’re feeling right now. Now I train physicians and other clinicians around the U.S. in how to perform Botox and dermal fillers and add them to their practice with my two-day CME course, and I’ve seen these physicians and other clinicians have extraordinary success in adding these high-demand, high-profit treatments to their practices. But I wanted to build a way that made it even easier to receive the highest quality medical training and create a community where everyone could have access to ALL of the information and answers. That was when I was determined to find a PRACTICAL and APPLICABLE solution to train ANY clinician and give you more control of your income an lifestyle. After months of training, implementing, and testing, We’ve finally created a training course that will get you up and running in days AND give you the answers to the all of the other parts of running a successful and profitable cosmetic practice. I know that you can be successful in adding these high-demand cosmetic treatments to your practice. I see it all the time. PS. You have nothing to lose and everything to gain. Remember my 100% Money Back Guarantee? Yes, I’ll refund you in full if you don’t think this is for you. PPS. Take action and stop procrastinating. The more you think, the more likely you’re to procrastinate. And the more you procrastinate, the less likely it is that you’re going to take action – meaning you’re going to be stuck right where you are forever. NOTE: Botox Training MD is a product that has been co-produced by Medical Spa MD. If you have expertise in areas of interest to our Members and you would like to discuss producing a course, please contact us. We want to talk.